There's a concept in Judaism named "ma'aseh avot siman l'banim," which roughly translates as "the deeds of the ancestors are a sign for the children." Of course, this phrase can be used positively, but it's most often used in a negative context. I thought of this phrase recently when I read that Bernard Madoff's daughter-in-law legally had her last name and her children's last name changed from "Madoff." Madoff's grandchildren will forever be plagued by the actions of their grandfather - "ma'aseh avot siman l'banim." Now, it has been reported that Judge Richard Goldstone has been barred from attending a family simcha - his grandson's bar mitzvah ceremony. The South African Goldstone was the head of a United Nations-appointed commission that investigated the Gaza war in the winter of 2008-09. The commission's final report accused Israel and Hamas of war crimes and possible crimes against humanity. The JTA reports that "Following negotiations between the South African Zionist Federation and the Beth Hamedrash Hagadol in Sandton, an affluent suburb of Johannesburg where the event is due to take place, an agreement was reached with the family that will keep Goldstone from attending the synagogue service early next month." I thought the Goldstone Commission's report was a one-sided attack on Israel. In fact, I recall feeling so relieved when I spent an hour listening to former Ambassador Dore Gold refute the Goldstone Report point-by-point. However, on the issue of whether Judge Goldstone should be allowed to attend his grandson's bar mitzvah, I find myself siding with the South African jurist. The synagogue should recognize that in this case, they are not dealing with the author of a United Nations report that harshly criticized Israel's actions. Rather, they are dealing with a zayde who wants to celebrate his grandson's life-cycle milestone. I'm sure the concept of "ma'aseh avot siman l'banim" will come to play in other aspects of the lives of Richard Goldstone's family, but in this case this was not the correct decision. Richard Goldstone will attend his grandson's upcoming bar mitzvah in South Africa, following an agreement with local Jewish groups. The South African Jewish Board of Deputies brokered a deal between Goldstone and community organizations angry with Goldstone for his authorship of a U.N. report on Gaza war seen as grossly unfair to Israel. Under the agreement, Jewish groups agreed not to protest during the bar mitzvah celebrations and Goldstone agreed to meet with the leadership of South African Jewish communal organizations, according to an e-mail released late Friday by both Goldstone and the Board of Deputies. The meeting, to be hosted by the South African Zionist Federation, is set to discuss the Jewish community's reaction to the Goldstone report, which accused Israel and Hamas of war crimes and possible crimes against humanity. “My whole family feels joyful that we’ll be able to celebrate the bar mitzvah together,” Goldstone told JTA following the agreement. The South African Jewish Board of Deputies said it "respectfully requests, in light of the agreement reached, that all parties immediately desist all public activities on this matter so that the young man's bar mitzvah celebration can be returned to the privacy and dignity that it deserves." Goldstone originally had planned to skip his grandson's bar mitzvah next month after the Zionist Federation threatened to protest Goldstone outside the synagogue. That's right R. Miller. 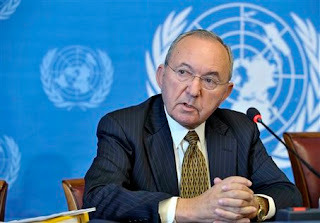 I cannot say whether I agree or disagree with J. Goldstone's report, I haven't read it. But how sad that the grandson can't have his grandfather there. The grandson should stand up for his family. Synagogues should not restrict judges to attend services, just because they rendered a poor ruling -- especially when it's a family simcha. Goldstone created a horrible report with fallacies about Israel's actions during the war, but they should still open their doors to him. Supposedly, the synagogue met with the family and Judge Goldstone came to this decision along with his family. I could see why the synagogue might not honor him with an aliyah or other honor, but this strikes me as unfair treatment.